Set on Charleston Harbor just a short walk from Patriots Point Links and the Patriots Point Naval Museum, the Cottages on Charleston Harbor is a charming waterfront resort with sublime views. Boasting breathtaking vistas of Fort Sumter and downtown Charleston, the boutique retreat features ten luxurious two-bedroom, three-bath cottages with fully equipped kitchens, sumptuous living rooms and screened private porches with hammocks and rocking chairs. Deluxe amenities include a complimentary continental breakfast served in-room or in the inviting communal lounge, coffee and snacks throughout the day, an oceanfront swimming pool and hot tub, and access to a private harbor front beach. The Cottages on Charleston Harbor features ten luxurious two-bedroom, three-bath cottages with fully equipped kitchens, sumptuous living rooms and screened private porches with hammocks and rocking chairs. Each cottage offers 1400 square feet of space and is beautifully appointed and individually decorated in comfortable, country-style décor and furnishings with soft hues and nautical accents. Cottages offer comfortable king, queen or double beds with pillowtop mattresses, luxury linens and hypoallergenic pillows, and en-suite or private bathrooms with walk-in showers soaking tubs, fresh towels, and bathrobes, and organic bath products. Separate spacious sitting areas have comfy armchairs and sofas, work desks with chairs, and large windows that embrace beautiful views. Secluded screened-in porches have tables, chairs, Adirondack loungers and hammocks and unobstructed views of Charleston bay, harbor, and city. Luxury amenities in each cottage include three flat-screen HDTVs, state-of-the-art Bose sound systems, fully-equipped kitchens with full-size appliances including refrigerators, microwaves, dishwashers, washing machines and tumble dryers, and high-speed wireless Internet connection. Additional guest services include daily housekeeping, newspaper delivery, and personal concierge services. A deluxe continental breakfast is served every morning in the Clubhouse lounge, on the pool deck, or in the comfort of the guest cottages and private porches. Breakfast treats include freshly brewed coffee and tea, fresh fruit juices and fruit, cereals and homemade granola, yogurt, baked bread and other goods, eggs dishes and more. Delicious refreshments, including home baked cookies and cakes, along with coffee, tea, and other beverages are available throughout the day in the Clubhouse lounge after breakfast service. Amenities at the Cottages on Charleston Harbor include a beautiful outdoor swimming pool and jacuzzi hot tub with stunning views of the Charleston Harbor, a private harbor front beach with tables and Adirondack chairs, and the use of beach cruisers to explore historic Patriots Point and beyond. A deluxe continental breakfast is served every morning in the Clubhouse lounge and refreshments, including home-baked cookies and cakes, along with coffee, tea, and other beverages are available throughout the day. Personalized enhancements for an extra special stay include private chef services with enchanting dining experiences with custom-made menus and gourmet cuisine prepared in the comfort of the guest cottages by private chefs. Guests can enjoy in-room massages and other body treatments, along with a bottle of chilled sparkling wine on arrival and a fully-stocked fridge with a pre-arrival grocery shopping package. 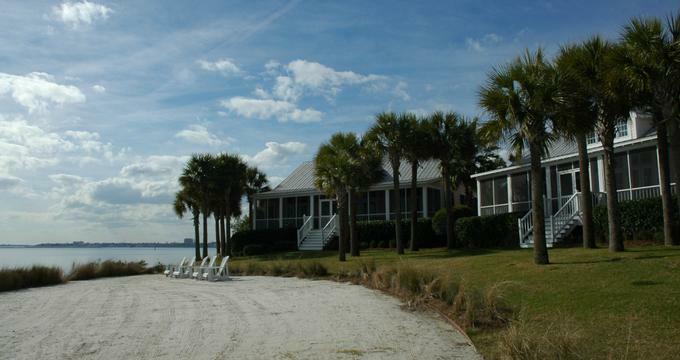 Other personal enhancements include a water taxi to historic downtown Charleston, professional babysitting services, and a game of golf at Patriots Point Links championship golf course. The Cottages on Charleston Harbor provides a variety of options for romantic weddings, intimate ceremonies, and elegant receptions. The resort’s beautiful spaces surrounded by lush marsh grasses, white sandy beaches and turquoise waters lapping the shoreline, the calming sounds of water lapping at the shore and the lovely cityscape of Charleston Harbor make for an idyllic backdrop. The Cottages on Charleston Harbor offer a variety of spaces for all types of function from two lawn/beach areas with views of Charleston Harbor to private porches for smaller, intimate affairs. Good Food Catering offers a variety of dining options for rehearsal dinners, wedding receptions, corporate dinners, and farewell brunches with restaurant quality style and service and personalized menus served in a variety of settings.